Lots of times we are moved to help an organization, but don't have the funds to give a cash donation. 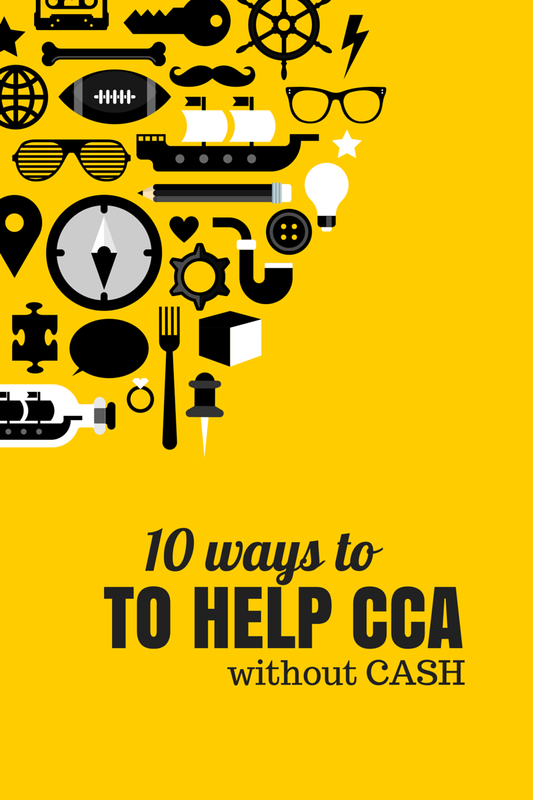 If you want to help, here are 10 Ways to Help CCA without Cash. Passionately talk about CCA. Whenever you have the opportunity - or can make one - tell friends and strangers about the good work that CCA does for children with facial differences. Like & Share our social media posts. Take surveys online. Opinions 4 Good (OP4G) is an online market research company that provides funding for nonprofits across the country. We have partnered with Op4G, so when you sign up and select CCA as your charity, we receive the survey incentive, which ranges from $1.00 to $5.00 per survey! For each new member joining the online survey community, OP4G will continue to donate to the Children's Craniofacial Association. Long term participation will provide additional donations throughout the year, with the average survey paying $3.50 for about 10 minutes of your time. Click this link to register -- it's a great, easy, and pretty fun way to raise money for CCA! Shop online through donation portals. When you shop through iGive.com, GoodShop.com and smile.amazon.com, select CCA as your charity of choice and a portion of your purchase will go to CCA each and every time! Make sure you bookmark these links so you never forget to shop via the donation portals. It may seem small, but when our whole community participates the funds really add up. Donate your time to write for the CCA Blog. We need writers to write about their experiences living with a facial difference as an individual or caretaker. If you're interested, please email Erica Mossholder. Turn trash into cash! By collecting old cell phones, printer cartridges, laptops, and aluminum cans, you can raise serious bank for CCA. You can collect cell phones, print cartridges, and old laptops from your home, school, or office and mail them to CCA. Then, we can recycle them for money. We'll even send you a prepaid shipping label to get those hunks of junk to us! If you prefer to collect the "trash" yourself, why not collect aluminum cans and turn them in for scrap metal? Did you know about 33 cans equals $1? Get creative and collect cans from your break room and lunch room too; you're simultaneously helping the environment and CCA Kids! This funny video will inspire you to get your kiddos in on the action! Donate your artistic talent. Are you a budding artist or up-and-coming photographer? Why not set up at a farmer's market or on local art nights and draw caricatures for donations? You can schedule portrait sessions with your friends and family and donate the usual session fees to CCA. Even better, if you have musical talent, spend a few hours each week busking for CCA. It's a great way to edge out of your comfort zone, hone your skills and make money for a cause you care about. Pro Tip: Wear a CCA shirt and post a flyer around your setup telling folks that you're raising money for kids with facial differences. We have a feeling your audience will shine through with generosity! Host a Fill Your Cup Party. Invite your friends over for an evening of fun and do-gooding with a "Fill Your Cup" Party. You provide a beverage of choice (coffee, lemonade, sangria, beer) and your friends come over and fill their cups. You can plan games and activities (bocce ball, anyone?) or just hang out. The key is to charge a $5 or $10 "cover" and when friends come over to fill their cups, you have them place their donation in the a big CCA cup! It's cheaper than a night out and is super simple to organize. Present Wonder at your school, workplace, or civic organization. One of CCA's main missions is to make the world a kinder place. We have prepared presentations that we can share with you so that you can take the #ChooseKind message to your school or workplace. It can be as simple as tying the #ChooseKind message into a Sunday School lesson or as complex as asking your HR department to allow you to present Wonder company-wide. If you'd like to present, contact the office and we'll get all the presentation materials to you and help you prepare. Sell your old clothes and donate the proceeds to CCA. Plato's Closet and many other consignment shops offer cash for gently used clothes. Why not clean out your closet and turn your clutter into donations for CCA Kids? Every little bit helps and we don't mind if you turn some of your used goods into new swag for you and a donation to CCA! Get creative and send us your ideas on how to help CCA without cash!